George William Simpson was born in Barkston c1879 and bought up by his grandparents (Charles and Mary Simpson). In 1881 they were living in Barkston Gorse (off Frinkley Lane, between Hough and Barkston) though in 1891 they were in Aunsby. In 1901 George was a grocer’s assistant, working for William Crabtree in Main Road, Long Bennington. In 1904 George married Mary Jane Cook. She was a widow and 10 years his senior. She’d been living with her parents (Samuel and Susannah Dodd) in Sevastapol Place, Long Bennington, next to the White House. George and Mary moved to Cotham and then (by 1911) Stoke Bardolph (near Burton Joyce) where George worked as a waggoner. By 1916 he was a waggoner for George Henry Ross of Moor Farm, Stubton. He joined the Labour Battalion of the York & Lancaster Regiment on 1st Aug 1916 (later the Labour Corps). He served 2 years in France before being sent back to England in Nov 1918 with a serious case of pneumonia. 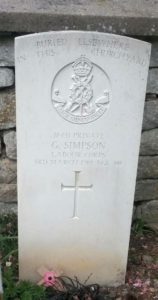 He was admitted to the Royal Herbert Hospital, Woolwich but died on 3rd March 1919. By this time Mary was living in Church St, Long Bennington and George was buried in Long Bennington churchyard.